Grateful and Giving. Mature disciples are filled with gratitude for God’s gifts. As stewards, they cultivate their gifts and return them to the Lord. 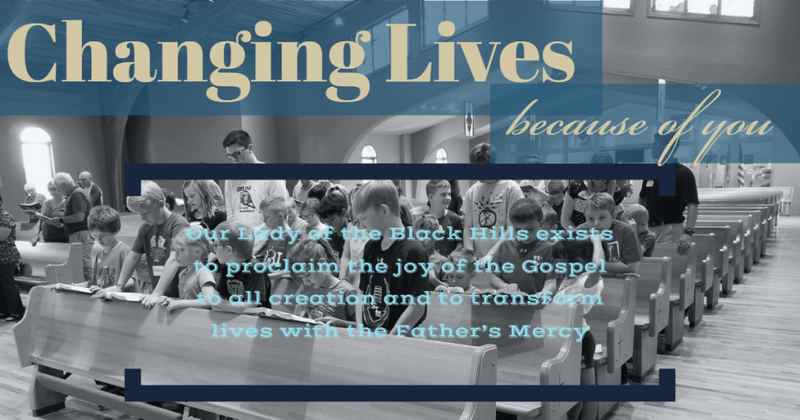 Our Lady of the Black Hills offers the convenience of online automatic recurring or one time donations. You can also text your gift to 605.250.1141 or DONATE NOW. For automatic recurring donations, signing up online allows you to easily support the parish on a regular basis, even when you are out of town or celebrating mass at another parish. There are multiple options for how often to donate and you can easily set them up when you create your account. In addition, by signing up online, you will have access to records of all of your online donations whenever you want to see them. All information submitted through this service is encrypted using 128 Bit SSL technology and conforms to the highest set of security standards in the payment card industry. See vancopayments.com or call 800.675.7430 for more information.